Espacio Mexican-Style Lager Celebrated with a Release Party at the Ecliptic Brewing Pub. Originally brewed for the 2017 Oregon Brewers Festival, Espacio Mexican-Style Lager with Lime Zest is making its return as an official part of the Ecliptic Brewing Seasonal Series line-up. To celebrate the release of the beer Ecliptic will host a Space Tacos Fiesta at the pub featuring a taco takeover and more. “Espacio is a beer that people have been asking about since it debuted at OBF. Now that it is becoming part of our line-up I knew we had to throw a party.” said Marketing Manager at Ecliptic Brewing, Karolyn Simon. “Tacos and Espacio go great together and the idea of a Space Tacos Fiesta came to life!” explained Simon. 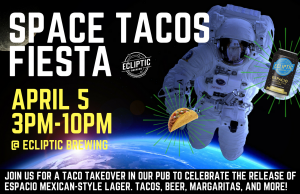 On April 5th from 3-10pm Ecliptic Brewing will stop serving their pub menu as usual and instead will feature a delicious line-up of tacos, flan, margaritas, and beer. Hot Mama Salsa will also be on site from 4-9pm sampling out their delicious, fresh, and authentic salsas. Where: Ecliptic Brewing, 825 N. Cook Street. What: Espacio Mexican-Style Lager, Tacos, and more! Espacio will be available in both draft and 6pk-12oz cans throughout the Ecliptic Brewing distribution network. Ecliptic Brewing is a venture from John Harris, an Oregon beer icon whose background is steeped in the state’s rich craft brewing history. The name Ecliptic unites Harris’ two passions: brewing and astronomy, and as such, the brewery celebrates the Earth’s yearly journey around the sun through both its beer and restaurant menus. Executive chef Michael Molitor rotates his seasonally inspired menu every six weeks in accordance with the old-world calendar. Harris’ signature beers include Orbiter IPA, Carina Peach Sour Ale, Starburst IPA, and Capella Porter. For more information, visit: www.eclipticbrewing.com. Ecliptic beers are available at the brewery (825 North Cook St), in cans and bottles and on tap throughout the area, and distributed by: Maletis Beverage (Portland, Salem, Vancouver WA), Bigfoot Beverage (Eugene, Bend, Coast), Fort George Distributing (Norther Oregon Coast, Southern WA Coast), Summit Beverage (Sourthern Oregon), Northwest Beverage (Seattle, Tacoma), Odom (Easter WA, Norther Idaho), Dickerson Distributing (Bellingham), Crooked Stave Artisans (Colorado), Freedom Distributors (North Carolina), and Graybeal (Eastern Oregon). Have you been to Ecliptic before? What is your favorite beer there?